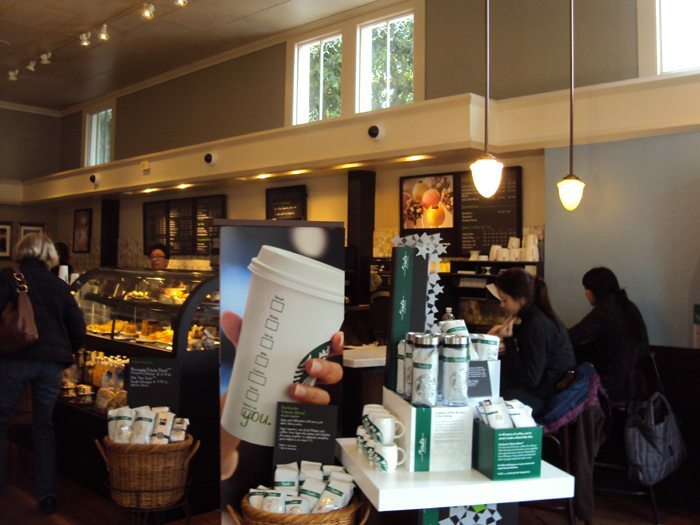 Located on the corner of Laguna Street and Union Street in San Francisco, in a beautiful neighborhood, yet with busy streets, stands a nineteen year-old Starbucks. 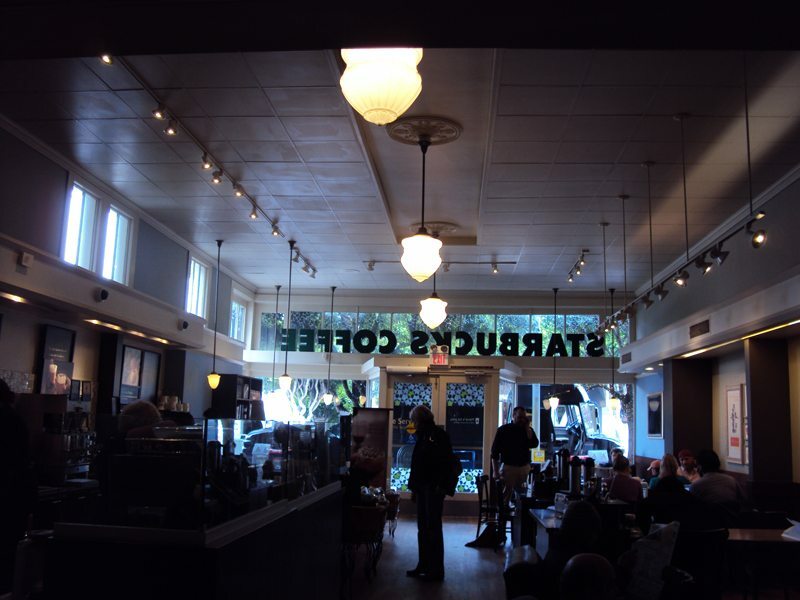 The doors were first opened to the public on March 6, 1992, and the very first store manager of this iconic location was then-Starbucks partner, Gina Marino. The exterior logo signage gracing this building is still my beautiful Siren dating from the 1987 to 1992 era of Starbucks. After Starbucks went public, in June 1992, the logo went through a major revision, with the lower half of our Siren being amputated off, no longer showing two full tails and a belly button. This store has been calling my name. I realized that if I didn’t run and see it soon, I might never see its old 1987 to 1992 era logo. As you may recall, on January 5, 2011, Starbucks announced a new logo. (I wrote a second blog post about the January 5, 2011 event at the SSC, which includes a very short audio segment of Howard Schultz.) At some point, we will see Starbucks pulling down the old 1992 to 2011 versions of the logo and replacing them with the newest logo. I assume these beautiful 1987-1992 logo historic artifacts, from a Starbucks history long gone by, will eventually come down too. I didn’t want to wait to see this gorgeous store, so I hopped on a plane to San Francisco for a day. This store radiated that it has stories to tell. I got very lucky on this trip. 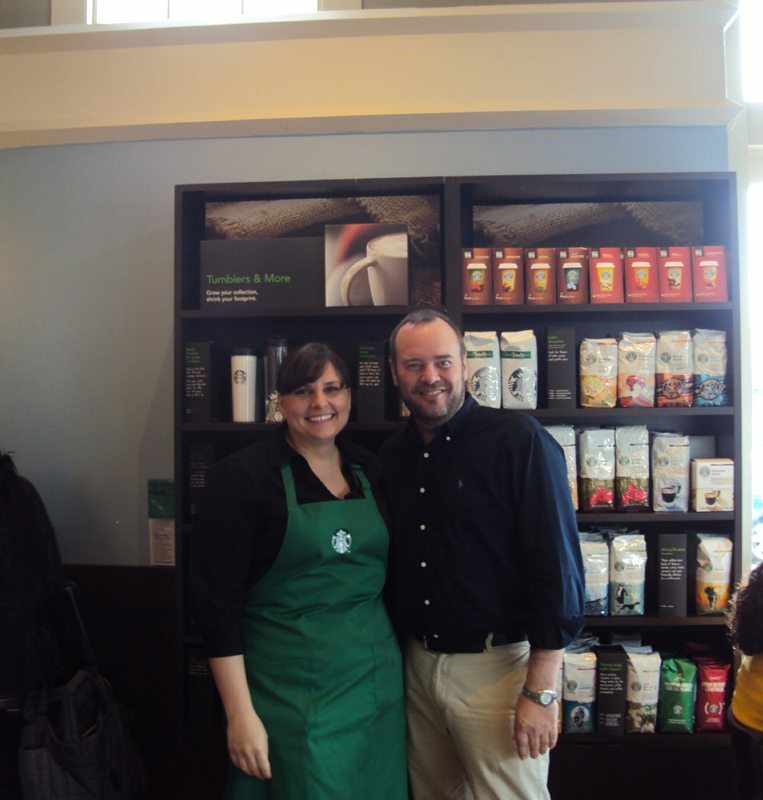 Inside the store, I met a partner named Kristina who is still acquainted with this store’s very first store manager! Through Kristina, I learned the exact opening date of this store which Kristina confirmed with Gina! The current store manager is a 15-year partner named Anastasia. I had such a great time talking with her. We chatted for a long time about what coffees we loved. She described herself as currently being “on a Gold Coast kick” which is a phenomena that I understand. We paired Tribute Blend with pumpkin spice loaf and chatted in a small group. Much to my surprise, as we socialized I realized we had a favorite barista in common. 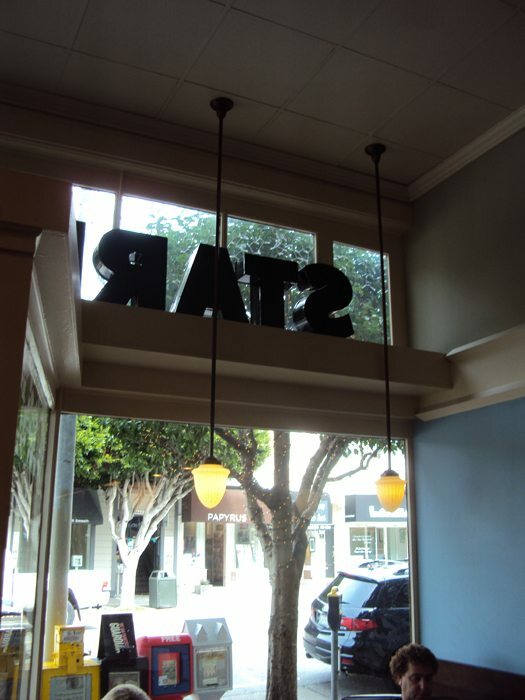 She had worked with a partner named “Pat” who had moved from downtown Seattle and ended up in this store on Union Street. I knew exactly who she was talking about. I remember Pat. He was a partner at the Columbia Tower Starbucks, and then I remember that he left there to move to San Francisco. It’s a small world! At the end of the visit, Anastasia told me that she had heard this Starbucks had been the model for some collectible model. I think (though not 100% positive) that she is referring to the beautiful 1990s-era Starbucks partnership with Department 56. There are so many beautiful details to this store, and I can see how it fits (with a lot of creative license taken, since it doesn’t snow in San Francisco) the 1990s-era “Snow Village” collectible produced by Department 56. (If anyone knows exactly the right information here, please weigh in!). Sorry but I don’t have a photograph of the Starbucks Department 56 collectible to share. Notice the big green Starbucks Coffee lettering inside the store on the upper ledge. Notice the beautiful lights. Apparently the lights were uniquely designed for this store to give it a warm and inviting feeling. As Anastasia pointed out the gorgeous details of the store to me, she didn’t miss saying hello to regulars coming in, greeting them and welcoming them. She described that she fell in love with this store long before she was the store manager. She first saw it during a holiday season with store bedecked in lights on and twinkling, and the inside full of sparkle. I have to confess that I took far fewer photos of this store than I wanted to. It was packed the entire time I was there. So all in all, it was an amazing visit to this Starbucks. I’m passing on to you the little bit of this store’s history that I gathered today. Hope you enjoyed it. Jim Donald, current CEO, and Howard Schultz were chatting just before going onstage at the 2004 shareholders meeting when Howard remarked to Jim that he couldn’t believe Starbucks was about to open its 9,000th location. Jim replied by saying, “Howard we haven’t opened 9,000 locations. We’ve opened one store, 9,000 times. 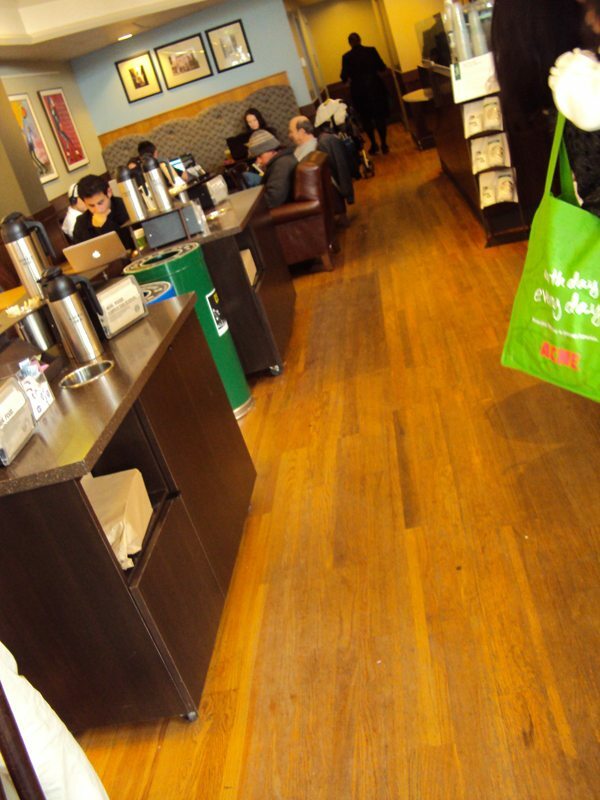 I don’t want to open up a debate that has anything to do with Howard Schultz or Jim Donald, but rather note that if every Starbucks store got to tell its story, we’d see a lot of common themes, common friends, and shared favorite coffee offerings. 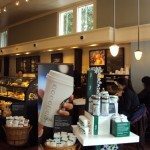 Gig Harbor Clover – Reserve Starbucks: 2 Thumbs Up. I visited this store in 2009 (and I think I sent you a photo of that as well after my visit) and directly wondered about the logo. I still can remember my visit very well…it is up on one of the hills in a beautiful neighborhood of SF I think. Nice houses around there. I think I took a Venti Frappuccino there cause it was a hot day. That is so nice you took a one day journey to this store. I am somewhat familiar with the area although I have not been to this store. The staff sound just great. I love the quote from the book. It is so true. Sounds like the customer is truly welcomed at this store. What a beautiful store! love the high windows, and of course the ‘siren’. am wondering: what is the light green ???? bag???? in pic #5, the one showing the beautiful wood floors.? kind of scary to think of all those logos going…. I would hope they leave them all til they no longer function. ps: “Dept 56” was associated with our beloved Marshall Field’s, an exceptional place. 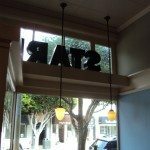 The logo at my local SB is not going anywhere soon according to the SM. I do love the old logo, the new logo hasn’t grown on me yet, luckily i still have my tumbler! I do love when a store has had enough history to have a story that they know and love and share – thank you for sharing it with us Melody! I like all of the logos. I like where the new one is taking the company (“beyond”), but also really like the old ones. I really like this store. It reminds me of one I went to in New Orleans a few years ago. I love the ones that are retrofitted into older buildings but still manage to keep some of the building’s personality. And I second the suggestion of John Moore’s book, Tribal Knowledge. Nice story. Something you hear over and over when you talk to sbux partners. I see why they changed the logo, but I like the old logos. I even miss old logos of other brands. It’d be neat if they’d do the old logos on anniversary products – perhaps for 50th in ten years? I’m glad you found what you were looking for…and more! I love such unexpected positive experiences. Thanks again for sharing your quest with us all. I do still like the old logo! I am interested to see the new cold cups with the new siren though! Beautiful store! Hope they get to keep the old logo sign for a long time. @CD – I am enjoying reading Tribal Knowledge but the scary thing is that so many of the things in the book hold little relevance to today. Starbucks has done many things that they said they would never do. Tribal Knowledge, like Pour Your Heart Into It, feels a bit like reading a history lesson book. @darkkatpouncing – I’d love to hear what you think of Tribute Blend Via. I bought another package of it tonight because it may soon be gone! @caeruleus & @latterose – Glad you like! I aim to find store’s with a story and something unique to tell about them! 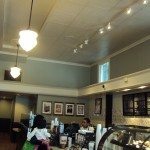 I’m sure that lots of stores have great stories to tell, but passing on the history of a Starbucks location is a bit like an oral tradition going from store manager to store manager. Many SMs don’t know the date their store exactly opened or the circumstances surrounding it. Surely the SSC has data somewhere, but I have no idea. I’d love to know if there is a list somewhere of every Starbucks with something in it from 1987-1992. I guess so far I’ve found 7 stores total, 6 of which are in western Washington. I so love reading your “travels”. 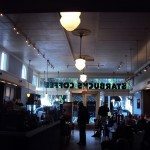 Whether they are out of state, or just local, it is a chance to see Starbucks all around, and how they embrace the community, or not. Well, as always, keep up the good work. @WO – I clicked on those links you gave and that’s definitely based on 1912 Pike Place! Just as there were more than one style of Limoge Starbucks collectibles, maybe there was more than one Department 56 item! I have actually never seen yours before – Very cool and highly collectible. The on that I’m thinking of is called “Snow Village” – If you google Starbucks with Snow Village with Department 56, I think you can find some images of it, though I have no to share where I’m the copyright holder. I love your Pike Place Department 56 house. ^ The old blog post on the Limoges, just for the heck of it. re: Tribute VIA. hee’s the question: is it fading out with the Tribute beans? (as you implied, Melody?) I am pretty sure I read a word or two from Cecile in Ideas in A., responding to someone lamenting the loss of Tribute and she said (something to the effect): you’ll still have the VIA to keep you happy til fall…..something like that. ??? I assumed she meant Tribute VIA since we know we have the rest of it from now til eternity…. I do like it, and would prob. choose it over Italian roast (VIA) I know my store manager and other partners are under the impression that Tribute VIA will soon disappear. I’ll have to go ‘over’ and look at that comment again. also, I intend to read Tribal Knowledge but, as you mentioned, I’m afraid it would just sadden me..the huge changes, that I consider mostly NOT for the better. I do think it would likely be excellent reading for most of the young baristas (which I think would be a huge majority) so they could know what Sbux was once. Gina Marino is now a former partner? What a shame!!!!!! Gina was the best, no question. @BayAreaBux – I’m pretty sure her friend Kristine said that Gina Marino is a former partner. Sounds like you knew her. Very cool. I assume that after a long career with Starbucks, it was probably just time to do something else, but I have no idea about the circumstances her leaving. It does remind me, in the book Pour Your Heart Into It. Howard talks a lot about early partners, even at the store level. Less so in Onward. Howard does mention Chad who is the current manager at 1912 Pike Place. I really like Chad so much. He deserves to be recognized. I feel great for him. Kristina = store level partner, or Kristine Hung = RD for San Francisco? Since the DM is there it is possible that the RD and DM were touring — what timing! I’m thinking you had two have met Kristine Hung. 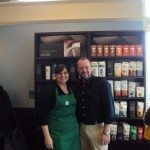 Gina and Kristine are/were two of the classiest and inspirational Starbucks partners out there. As you may have heard over on SG, people of their caliber are very hard to come by these days. I was working for Starbucks in Seattle for about a year when I decided to transfer down to SF for a while and I ended up in the Polk Street store but I’d often fill in shifts at Union St (there were only seven Starbucks in SF by the time I was there). I knew Gina as she had been promoted to district manager by the time I was there…she and my store manager (who had been an asst under her at Union) thoroughly disliked one another and spoke to each other through clenched teeth whenever they had to be in the same room…rather amusing. My main memory of Union St was that the poor partners got NO time for a learning curve…within one hour of opening their doors on the first day there was a line out the door. That store was just ALWAYS busy. Also someone there once created, via garbage bags and duct tape, a stylin’ “Mocha Suit” to put on when mixing the shaved chocolate and hot water that made up Starbucks chocolate Guittard syrup. I didn’t even realize iv been to this store before, but after seeing the pictures i remembered iv been there a few times now… anyway thanks for the post. 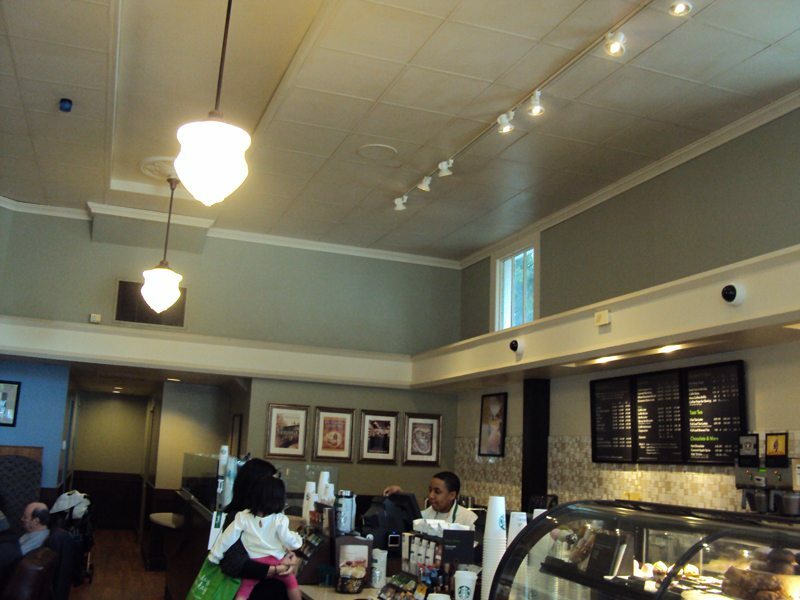 They just redid the interior of the Union and Laguna Starbucks! @Jac – did they keep the old sign? After reading your blog and adding the store to my itinerary for my San Francisco visit, I found that sadly the ‘original’ exterior logo sign is gone, replaced with the new one. Unfortunately I didn’t have a chance to take pictures for you. They had 20-year anniversary tumblers for the store, similar to the Indivisible and other 16 oz. tumblers, if I recall correctly. I really liked the atmosphere, and the staff was all very welcoming and friendly.